Affectionate, comforting, enjoys lazy evenings curled up on a comfy couch, sensitive, intelligent, caring, loves kids, gives unconditional love, great hugs and sweet kisses. Sounds like something out of a personal ad, doesn’t it? Well, it’s not what you think. These words describe Teddy, our 3-year old Bernese Mountain Dog. I knew when he was a young pup that he would grow up to be a very special dog. So when he passed his therapy dog test, it was a remarkable moment. It’s been a dream of mine to share Teddy’s wonderful temperament and personality with those who need comforting the most. Passing a therapy dog test doesn’t make this handler an expert. Oh no, far from it. We have only just begun this journey and we have a lot to learn. Preparing for and passing the test gives me the chance to share the experience and offer some advice to others who might also dream of doing therapy dog work with their canine partner. There are many therapy dog organizations and they all have different testing requirements. Here are some tips to help you get ready for testing. There’s very little you can do without a good foundation. It’s true in life and it’s true in dog training. Dogs don’t just wake up one day and trot around with perfect manners. Come to think about it, neither do humans. Great temperament is very important, but even dogs born with charming personalities need training. So try to find a trainer or a training club in your area, hopefully one that embraces positive reinforcement. Training is a great way to build a strong bond with your dog. Basic obedience or manners classes and lots of socializing with your dog will help both of you, plus it’s a great way to observe the temperament of your dog. Is he reserved or outgoing, shy or friendly, calm or high octane? You know your dog best. Be honest with yourself about his personality and whether he might be cut out for therapy dog work. In my opinion, training is for the life of your dog. Basics are important and building on that foundation makes a great team. Taking the CGC (Canine Good Citizen) test is a perfect precursor to the therapy dog test. CGC classes are fairly easy to find. Therapy Dog classes are a bit more challenging to locate, but they do exist. Taking advanced obedience classes is not a requirement to take a therapy dog test, but going beyond the basics will give you better skills and the confidence to pass the test with flying colors. So, establish your foundation skills and keep building on them. Advanced training for competition in obedience, rally, agility or K9 nose work is a great way to build an amazing bond with your canine partner. Obedience training has opened up a brand new world for Teddy and me, and we’ve made some wonderful new friends in the process. What’s not to like. Remember … you aren’t just training your dog. You are BOTH in training. You are a team. Classes are one thing, real life practice is another. If you are confident that your dog is comfortable around other people, take him with you whenever you can. Use a new location to practice the skills you learned in obedience, CGC or therapy dog classes…things like sit, stay, loose leash walking and especially the “leave it” command. A dog who might be perfect at home faces new challenges when he’s out of his comfort zone. It’s great practice to get out of your familiar training location. We go to local home improvement stores to practice heeling, sits and downs. There are loud noises and plenty of distractions around us. Whenever we go to a commercial pet store, we do heeling work down the aisles and sits and downs where there are lots of distractions. And then there’s “leave it” practice. Any time we pass an aisle with fabulous aromas, I ask Teddy to “leave it” and when he ignores it….he gets a bonanza of treats! I have to admit that the pet store is a huge challenge for my dog. We only spend a short time there and I make it a positive experience with lots of positive reinforcement (delicious treats and my vocal praise). Well, with so many distractions, it’s a real challenge for the dog…food smells, lots of other animals passing by and toys at every turn. If it’s too much stimulation, you’ll spend most of your time redirecting your dog so limit your time there and tell him how great he is when he succeeds. Again, it’s hard for them. If it’s too much, choose a less stimulating environment and help him have a successful experience instead of a negative one. How would you do in a Godiva chocolate factory? I rest my case. Please be aware of your dog’s comfort level. If you feel that he is stressed, has had enough or is uncomfortable, stop. Be an advocate for your dog and know when enough is enough. Get him a toy for being such a good boy and then take him home. You want your dog to remember this place as positive experience. Going to the farmer’s market is great training. 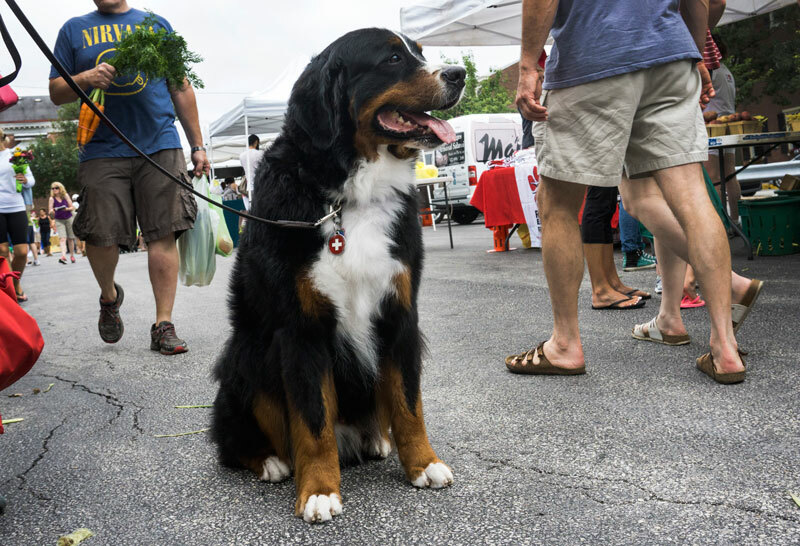 I take Teddy to the farmers market every weekend. It takes a while to get through the market. With his good looks and his wagging tail, Teddy always draws a crowd of admirers. I love it and Teddy loves to make new friends. Market is a great place to socialize. There’s lots of people, baby carriages, grocery bags, scrumptious food and plenty of other dogs…but therein lies a challenge and sometimes a danger. Some of those dogs might not be under the control of their handler. Or, perhaps your own dog just isn’t into crowds. Is your dog happy in this situation? If he’s not cool with it, leave him home. You know your dog best. My eyes are always on Teddy and I’m ready to exit stage left if another dog lunges in our direction for a sniff festival. In perfect world, people approach you slowly, every other dog is friendly and every child asks you first if they can pet your dog. Reality is another thing altogether. The bottom line is that YOU are an advocate for your dog. Keep him safe, make sure he is having fun. While you’re out and about, take the time to do a little breed education. 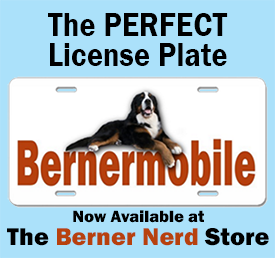 Tell people all about your beautiful Bernese Mountain Dog. 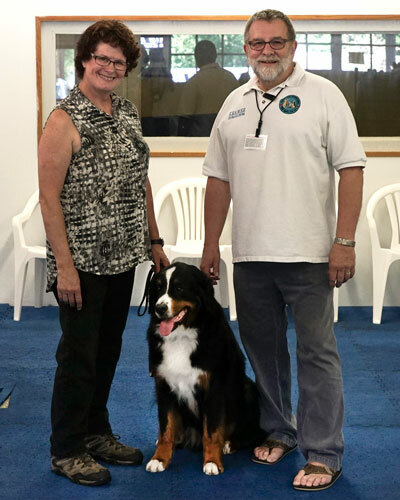 If you become a therapy dog team, I suspect you’ll be telling the people you visit all about Bernese Mountain Dogs. Might as well practice your presentation. Every therapy dog test is different, so I won’t go into each and every skill needed to pass a test. There are some common denominators. One very important skill is loose leash walking. You don’t have to worry about strict competition style heeling. Your dog just needs to be able to walk next to you in a relaxed manner without pulling you all over creation. Your leash is slack, not tight. When you walk down a hospital corridor with your therapy dog, you don’t want to look like you’re parasailing behind him, right? So develop good heeling skills and loose leash walking will seem like a vacation. Tell me that you wouldn’t really love to dive into a scrumptious chocolate cake placed an inch from your nose. What dog wouldn’t simply be in heaven if he found a piece of filet mignon on the ground! Well, a sizeable chunk of filet mignon was on the ground as part of Teddy’s therapy dog test. We had to circle that piece of filet mignon twice and Teddy was not allowed to touch it. No tight leash steering him clear of it either. Teddy Teddy leave it leave it leave it, here here here Teddy Teddy Teddy. Why is “leave it” so important? Well, a hospital setting can present all sorts of hazards for your dog. We practiced “leave it” in class by walking past distractions such as food bowls, toys, a box of treats, you name it. In our garage, Teddy and I did figure 8’s around chunks of hot dogs, string cheese and pieces of bread. The hardest challenge of all was asking someone to place a piece of food in the palm of their hand and place that hand near my dog’s mouth. I say “leave it” and Teddy has to leave it. He was rewarded heavily with delicious treats when he left it alone. We are always going to have to work on that skill. A dog is a dog. I can relate. I’m no better. Why? Well, if you’re looking the other way, I’m diving into that chocolate cake. 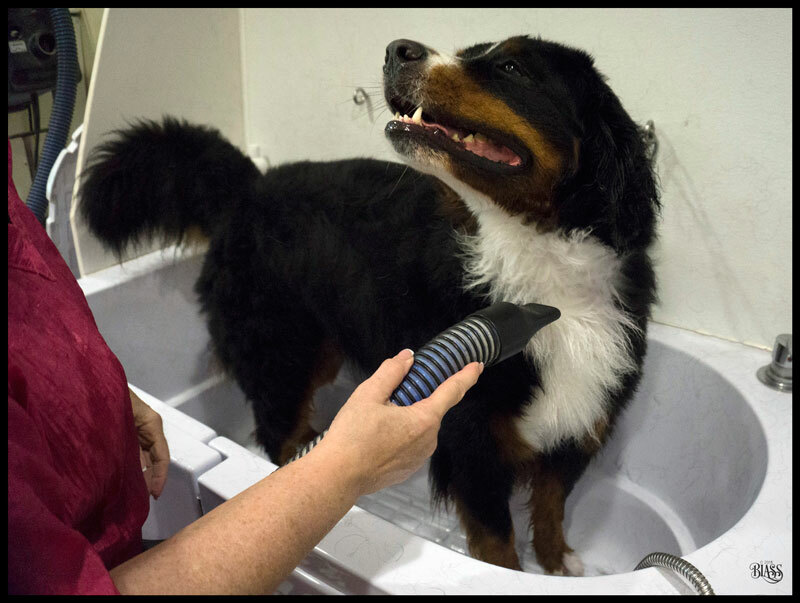 Teddy gets a bath before taking his therapy dog test. Gotta be clean as a whistle! Do your research before choosing an organization for your test. There are many things to consider. Are the test requirements strict? They should be! Does a veterinarian have to certify the health and up to date vaccinations of the dog? Absolutely! Does the organization provide liability insurance? That one was a big deal for me. There are many programs out there. Here’s a link to therapy dog organizations on AKC’s website. Check out these organizations for their testing requirements. They are not all the same. Perhaps some of these organizations offer classes or testing near you. Speak with someone at a local hospital or nursing home to see if there’s a need for a therapy dog team once you are certified. We will be joining a local chapter of the organization that certified us. Having a support system will help us get out in the community. Guidance from experienced therapy dog teams will help us get our feet on the ground. I know we will learn a lot from the experience of others. Eileen and Teddy with Steven, TDI evaluator. I thought about that for a moment and spoke up. “What about the dogs?” I said. Steven smiled and assured us that all the dogs passed. It was the HUMANS that needed to pass this test! That’s when my eyes welled up big time. Our evaluator was absolutely right. The dogs were all trained, prepared and ready for this test. The dogs knew what to do. It was the humans that needed to get it right. And that brings up a valuable lesson. Teddy and I have been training together for several years. I’ve come to realize that when things go south for us at obedience and rally trials or in class, it’s not him. It’s me. We’re a team. I’m supposed to be the one guiding that team. And so, there I was, fumbling around in a bag for my camera after our test. I asked if we could pose for a picture with our evaluator. I should have asked Teddy for a sit/stay. If I had asked him to stay, he would have waited patiently for me to find my camera. But I didn’t ask him for a sit/stay. Silly me. Our dogs just want to please us, but if they don’t know what we want them to do, they are going to punt… and punt he did. Teddy stood on his hind legs and put his front paws on me. In a moment of panic, I thought that our evaluator might ask for that certification paper back, and our successful day would end up like some sort of bad dream. Thankfully, he didn’t take it back…but I walked out of the facility repeating to myself. It’s the human. It’s the human. It’s the HUMAN! This was a wonderful reminder of how it is the dog and the human and how you are both a team. You were so great at describing the entire experience leading up to and after the test. You and Teddy will make many people so happy as a wonderful therapy team, Eileen, especially with your humor! Great article! Teamwork and training the humans a valuable lesson. Quite eye opening when someone finally understands it. Worked for me and my Mini Schnauzer years ago. I’ve have used the same theory since for my other dogs through the years. Your compassion for humans and dogs alike informs your thoughtful, intelligent and super-fun writing! Bernerworld and beyond is a better place for how generously you share your knowledge and experiences, Eileen. Thank you! Megan, You know how much I appreciate your beautiful words. Thank you! Thanks for the great advice! Looks like I have a wonderful adventure ahead of me! I have been training & showing dogs in both conformation & obedience for over 50 years. 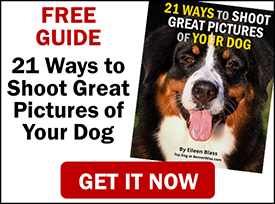 Everything Eileen said are words of wisdom for anyone training their dog for obedience, rally, agility & any other sport where you’re asking your dog to behave in a manner that he or she might not otherwise behave. Thank you for the insight. My Berner is a 3 year old male named Sullivan, Sully for short. He loves other people an d children especially . Other dogs he’s not so into, he tolerates them but doesn’t seem to want to romp around or play with them. He’s been around other dogs all of his life, dog obedience classes and neighbors have brought their dogs over to see him. He’s much more interested in the owners than the dog. 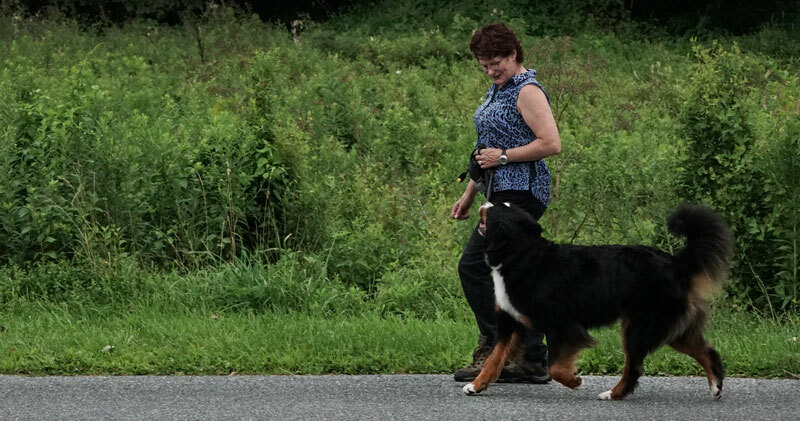 Except another Berner he occasionally has walked with. Should I push him to socialize with other dogs, should I get another Berner for him to play with , or is it okay for him to just be into people? Would he be a good therapy dog for people?